The aim of this work was to undertake a literature review on two different techniques of apical preparation of root canals e.g. apical patency and apical plug. Apical patency is a technique in which apical constriction and apical foramen are kept patent throughout the instrumentation of root canals. This technique prevents packing of debris at the apical area. It also helps to maintain working length. A small patent file 1mm longer than the working length is passed through the apical foramen passively. This technique is thought to ensure complete debridement of root canals. It is associated with less postoperative pain. The objections to this technique are the extrusion of debris, irrigating solutions, sealer and filling materials. It may also cause over instrumentation and foramen transportation. Enlargement of apical constriction or apical foramen through patency files is not supported by literature. Apical plug is the technique in which instrumentation is kept within working length of the root canals without using any patency file. This results in the formation of an apical plug composed of dentinal chips in the apical third of the root canal. Apical plug may be contaminated with micro flora and necrotic tissues leading to inflammatory reactions in the periapical tissues. This technique prevents the extrusion of debris, irrigating solution, sealers and thermoplastic gutta-percha. However, intentional packing with dentinal chips or biological compatible materials at the apical area is required in teeth with immature apices, root resorption, or when apical constriction is violated due to over instrumentation. The aim of this study was to evaluate the apical seal obtained with four root canal sealers in conjunction with lateral condensation technique in apically perforated root canals. A total of 38 single rooted teeth stored in saline were utilized. The teeth were instrumented to their anatomical apices to a size #45 MAF using the step-back technique. An apical stop was developed 1 mm short of the working length with the help of a size #50 K-file. Based upon the mesio-distal and bucco-lingual widths of the apical foramen the teeth were stratified and randomly divided into four groups of 9 teeth each. Each of the four groups was obturated with either Sealapex, Ketac-Endo, AH26, or Tubli-Seal in conjunction with lateral condensation technique. The remaining two roots were used as controls: positive with gutta-percha and no sealer and negative with the apex sealed with nail varnish. The root apices were immersed in 1% methylene blue for 7 days and then sectioned longitudinally. Dye penetration was measured using a travelling microscope. The best seal was obtained using Sealapex cement, which differed significantly from Ketac-Endo, AH26, and Tubli-Seal. There was significant difference between the latter. It is recommended that Sealapex should be the sealer cement of choice, in conjunction with lateral condensation technique, when obturating apically perforated root canals. The aim of this study was to determine the prevalence of pulp stones in a group of patients using radiographs, and to assess any associations with age, gender, tooth type, jaw, caries, restorations, attrition and periodontal disease. A total of 600 patient charts (319 males and 281 females) were selected randomly amongst patients referred to the Oral Diagnosis and Radiology Department, College of Dentistry, king Saud University. Bitewing radiographs were examined. The age of the evaluated patients ranged from 16 to 56 years old. Both maxillary and mandibular premolars and molars were evaluated. Frequency and distribution of teeth with pulp stones was calculated and statistical analysis was performed with chi-square test. Pulp stones were identified in 10.2% of the teeth examined. Molars had statistically more pulp stones than premolars (P<0.001). Teeth with attrition, first molars and patients of old age showed statistically more pulp stones. It was concluded that the prevalence of pulp stones increased with age and was significantly higher in molar teeth than premolars. 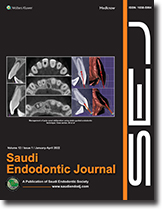 The features of pulp stones noted in this study may provide additional information about the dental morphological features of Saudis. Removal of all organic debris and microorganisms from the root canal system, and shaping the root canal space is a very important step in root canal therapy. This will facilitate adequate irrigation and filling of the entire root canal space. A number of techniques using hand instruments have been described, all of which have been designed to produce a tapered preparation. These techniques have a lot of deficiencies, but they are still considered to be the most efficient and suitable for clinical dental practice. Research into root canal preparation has led to significant changes in instrumentation techniques. New instruments have been developed, employing different metals and different engineering philosophies. There has been a significant move away from the ISO standard 2% taper instrumentation. Recent designs of endodontic instruments have variable tapers giving improved shaping ability. Nickel-titanium rotary instruments will rapidly and safely open the main root canals creating a deep space to permit full penetration of irrigant solutions. Practitioners considering changing their endodontic techniques, are advised to read the following preparation technique to gain competence before using these instruments in their clinical practice. This study compared the flare-up rate of endodontically treated molar teeth with necrotic pulp, using a Root ZX apex locater and NI-TI files in one-visit versus two-visits. Root canal treatment was done in 251 patients (129 in one visit group and 122 in two visits) using the same technique and filling materials. Patients were asked to circle the type of pain in a written form after 24 and 48 hours and after one week of finishing the root canal treatment. Pain was reported by very few patients of both groups during the first 24 and 48 hours, which disappeared during one week. A statistically significant difference (P= 0.029) in the reported pain was found between the two groups. It was found to be more in the two visit group. It was concluded that both techniques have to be viewed as part of a total endodontic treatment spectrum. The choice of preferring one over the other has to be determined by the circumstances surrounding each individual case. Two cases of moderate mucogingival argyria (tattoo) secondary to silver cone root canal fillings of maxillary left first molars are presented. The root canal fillings were done a long time ago. The patients were not aware of the gingival tattoo. Radiograph showed substandard root canal treatment with periradicular lesions. The silver points were removed and re-treatment was performed in addition to root amputation and root-end filling. Dilaceration of teeth can ocur as a result of trauma to its primary predecessors. Crown dilaceration is more rare than root dilacerations. This report describes a rare case of crown dilaceration of the mandibular central incisor caused by trauma. Periapical radiography and cone beam computed tomography scans revealed a severe crown dilaceration in the labial direction. After conventional root canal treatment, a glass fiber-reinforced post was placed and the tooth was restored using the original crown which was removed from the root before root canal obturation. One year after the treatment, the tooth was clinically intact without mobility and there was no sensitivity during percussion. Radiographic examination revealed that the periodontal tissues were healthy and there was no sign of root resorption. It was concluded that correct diagnosis and prompt treatment help to achieve desirable esthetics and function for crown dilecaration.